Teeth naturally yellow and discolour over time, but smoking, and drinking tea, coffee or red wine can also cause hard-to-shift stains. 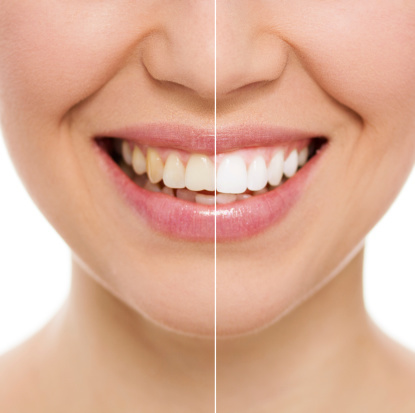 Teeth Whitening is a cosmetic procedure which can be a very effective way of lightening the natural colour of your teeth without removing any of the tooth surface. It cannot make a complete colour change, but it may lighten the existing shade. The degree of lightening depends on how severely stained the teeth are as well as on the nature of the stains. The whitening procedure we offer gives our patients full control over the result. With any treatment of this type, the effect will normally fade over time and our method gives patients the facility to top-up whenever required.